The essence of the Web is the link. We use it to navigate, discover, form communities and get high rankings (or not!) for our Web pages on search engines. But, each link carries much more behind it than what has generally been exposed. That is, until now . . . .
Frédérick Giasson is a pragmatic innovator of the structured Web and semantic Web. Most recently, his efforts have included Ping the Semantic Web (that aggregates RDF published on the Web), the Zitgist semantic Web browser (that enables that RDF data to be viewed in useful ways), TalkDigger (for finding and sharing topical Web discussions), and efforts on a variety of ontologies, including jointly with me on UMBEL. I have been an aggressive “linker” for some time and try to refer to Wikipedia often for definitions or background as well. Thus, Fred’s most recent efforts to continue to add value to the link as the basic coin of the Web realm really caught my eye. In the early days of the Web, links were used solely to visit specific Web pages or locations within those documents. Somewhat later, actions such as searching or purchasing items could be associated with a link. Most recently, with the emergence of the semantic Web, the very nature of the link has become ambiguous, potentially representing any of the link’s former uses or either direct or indirect references to data and resources. 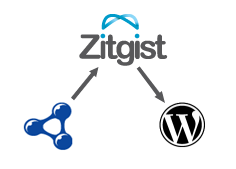 The Zitgist zLinks plug-in now makes these link uses explicit from within WordPress blogs. To retrieve data regarding resources. The emergence of linked data and the semantic Web (or at least the provision of data via the structured Web) are making the use of the link more complicated and ambiguous. Moreover, sometimes a link is an indirect reference to where data exists, and not the actual resource itself. What Zitgist’s zLinks does is to make these uses explicit and to remove ambiguities. Further, if a link is not to an actual resource but only a reference to it, zLinks resolves to the link’s correct destination. And, still further, a zLinks link is the gateway to still additional links from its reference destination, making the service a powerful jumping off point in the true spirit of the interlinked Web. To my knowledge, zLinks is is the first and purest implementation of what Kingsley Idehen has termed the “enhanced anchor” or <a++>. RDFa and embedded RDF have similar objectives but are not premised on resolving the existing link. 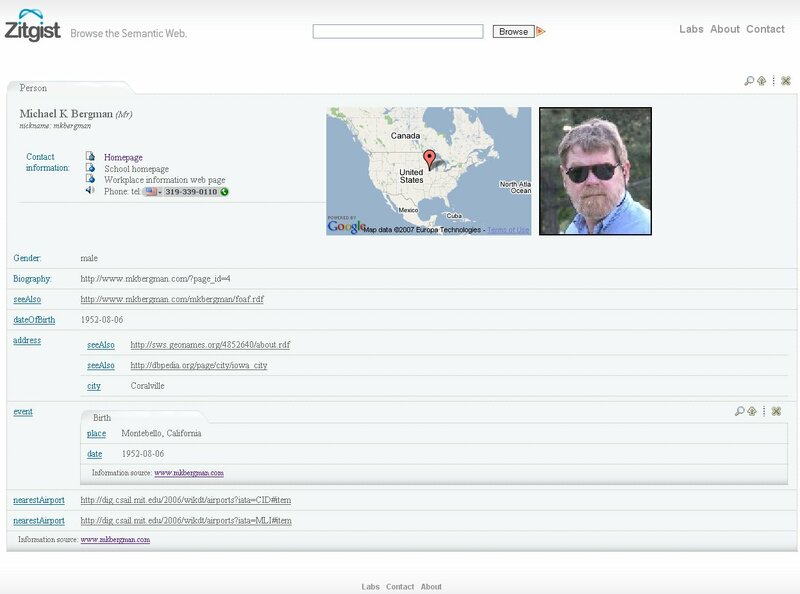 Like the SIOC Import Plug-in, which imports SIOC metadata into a WordPress blog, the zLinks tool recognizes the importance of standard blogging software and automated background tools to expose data and capabilities. Since WordPress has many hundreds of thousands of site owners and bloggers — not to mention hundreds of millions of visitors — zLinks could be an important first exposure for many to the real power of linking and the semantic Web. As a site owner, zLinks works identically to other plug-ins: simply install it and then it works smoothly and easily. If the initial zLinks link references data, that data is now resolved to its proper direct location, and is presented as RDF with further meshing and manipulation available. Other resources may take you directly to a Web page or perform other actions. Some of those actions, for example, may be to format data results in specific views (timelines, maps, charts, tables, graphs, structured reports, etc.). If the sources are data, the ability to make transformations or present the data in various views opens a rich horizon of options. I made some minor tweaks to the Zitgist distribution as provided. First, I replaced the initial link icon — — with this one — — that is smaller and more in keeping with my local WordPress theme. I did this simply by replacing the mini_rdf.gif image in the /public_html/wp-content/plugins/zitgist-browser-linker/imgs/ directory. Then, also in keeping with my local theme, I made the text in the popup a bit smaller. I did this simply by adding a font-size: 80%; property to the style.css stylesheet in the /public_html/wp-content/plugins/zitgist-browser-linker/css/ directory. And, that was it! Simple and sweet. It is also important to realize that this is just a first-release prototype. Some initial bugs have been discovered and worked out, sometimes the server site is down, and longer-term potentialities are only now beginning to emerge. But, this is still professional software with much thought behind it and much potential in front of it. If it breaks, so what? It is free and it is fun. To all of you out there new to RDF and structured, linked data, I say: Play and enjoy! zLinks is only beginning to touch the most visible part of the iceberg. It is pretty clear that the use and usefulness of links are only now being understood. Harking back to the original listing of three possible uses for a link it is clear that “actions” and the use of the link itself as a referrer and “mini-banner” on the Web are still not appreciated, let alone exploited. It is interesting that AdaptiveBlue has also come out with a SmartLinks approach that differs somewhat from the Zitgist approach (items and linkages are constructed and then referred to from a central location), but their screenshot does affirm the untapped potential of links. 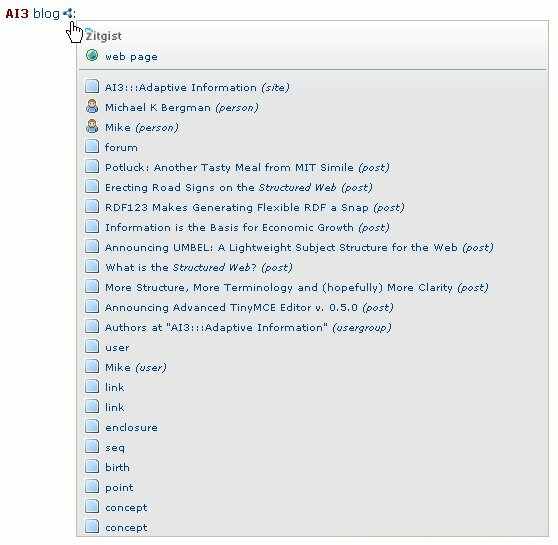 The W3C semantic Web community continues to grapple with resource/link terminology and nuances, the implications of which will be deferred to another day and another blog entry. However, suffice it to say that with a growing ‘Web of data’ and linked data, not to mention the original document vision and then one of commerce and services, the once lowly link is growing mighty indeed!